Our palatial two-storey Imperial Villa (378sqm) is an icon of pure sophistication and extravagance and promises unparalleled levels of personalised service. It is designed with a striking blend of the traditional Balinese residential style, blended with Javanese accents and Indonesian contemporary architecture. Hidden away from the main resort, within its own private confines, the aptly-named two-bedroom Imperial Villa accommodates a maximum of four adults and is regularly patronized by royalty and Heads of State. 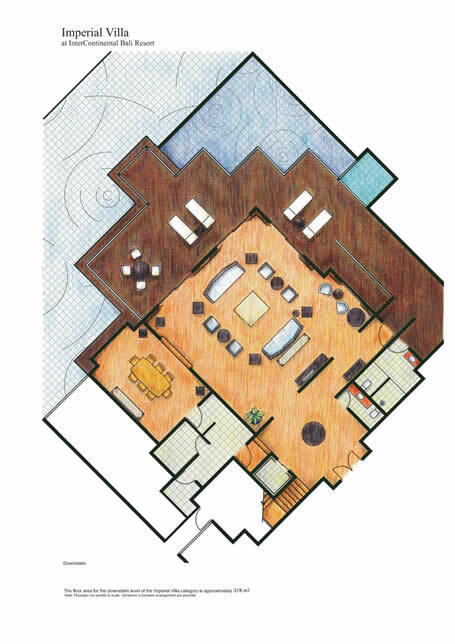 Boasting its own private elevator and direct driveway access, its interiors reveal a sumptuous living and dining area with work space and butler’s kitchen, perfect for entertaining and hosting formal dinner parties. Two lavish master bedrooms lead through to personal grooming areas and a spa-styled ensuite bathroom in marble, complete with walk-in shower and whirlpool bathtub with plasma screen television and luxuriant all-natural bathroom amenities by HARNN for the ultimate in bath time relaxation. Outdoors, the luxe tropical lifestyle continues with an extensive private terrace, complete with outdoor furniture, freeform swimming pool and indulgent outdoor whirpool, as well as direct access to Jimbaran Beach. Club InterContinental guests are entitled to special privileges and benefits that include exclusive access to the elegant 24-hour Club Lounge for complimentary light refreshments, afternoon tea, evening cocktails and canapés, as well as an all-day menu at personal charge. Club guests can also enjoy Club Lounge Internet access, 24-hour personal Butler Service, exclusive use of the Club InterContinental Pool and a choice of four different breakfast venues.